According to the current opinion, the architect Bernard of Venice was the designer of three buildings at Pavia, under the Visconti dominium: the Visconti Castle (1360-65), the Church of Santa Maria del Carmine (begun in 1370, but the façade was completed after 1500) and the Carthusia of Pavia (begun in 1396, but construction lasted for several centuries). These three projects are based - in plant - on geometric modules "ad quadratum", which reveal a spirit of unity and an equal awareness of the use of building materials. Studies in Pavia's medieval buildings assumed, by 13th and 14th centuries, the widespread use of the Paris foot (32.484 cm = 12 inches), a unit of measurement used by the builders of the Cistercian communities. At the beginning of the 16th century, with the end of the Duchy of Milan, its use was supplanted in buildings at Pavia by the Milan’s fathom (59.494 cm = 12 ounces). The change of unit shines, especially at Santa Maria del Carmine, in which we have the transition from the plan to the modular internal design and implementation of rosy brick façade by Giovanni Antonio Amadeo. To analyze the modular and geometric relationships of a project, it is very important to identify the units used by the builders. "Each master had his own group and its tradition, its habits, its instruments and, in particular, its measurement systems. It is possible to distinguish, in fact, during the construction of the cathedral of Chartres, the adoption of at least eight different systems of measurement. This explains the slight differences that exist even within the same building. " " One can imagine that when the representative of the Chapter gave his instructions and directives sent to the master, the latter could not fail him that used their units: 'All right! - the answer, then the canon - take your foot!' Thus this expression would come to mean to act freely, according to his discretion." The plan of this Castle is based on the addition of compositional forms "ad quadratum". Among the square bays of the wings and those of the arcades of the large square courtyard there is a relationship between prime numbers: 17 arcades corresponding to 11 internal bays. The golden proportion, repeated on six floors, is the basis of composition of the façade facing the courtyard. The modular unit was presumably based on a rectangle large 20 Paris feet (6.49 m) and high 12 Pf (m 3.90). So the height to the ridge of the roof is 60 Paris feet (less than 19.50 m). Another hypothesis may assume the following sizes: 10 1/2 Milan’s fathoms (m 6.25) x 6 1/2 Mf (3.87 m). In this case the golden number was approximated by the ratio 21/13. The diameter of the cylindrical pillars of the porch is one Milan fathom (we can rule out the possibility of 2 Paris feet, if one takes into account the differences of sculpture). All the vaults, both large and small, are made up of domes or voûtes domicales", built for concentric courses, with a "Byzantine" technique, quite different from the method of construction of the Gothic arches. This, in particular, is a factor for thinking the designer would be Bernard of Venice. The lateral thrust of such a kind of vault, or dome (Dome), is exerted on the entire perimeter, while the thrust of a vaulted Gothic vault “croisière” tends to discharge solely on the support pillars, in order to allow the opening of large lights in the side walls. The plan and the elevation of St. Mary of Mount Carmel are based on a constructive way "ad quadratum". 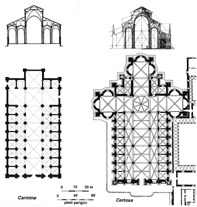 The whole plan is perfectly inscribed in double square mystical dimensions of 1 x 2 and is further divided into squares (the bays of the nave), with their sides equal to 1/3 of the great square of the plant and smaller ones (the aisles and chapels), whose sides are 1/6 that of the bigger square. In height, the aisles and chapels measure exactly half of the nave. This section, like plan, is a mosaic of modular squares, 20 Paris feet (a few less than 6.50 m). The height of the nave is 80 Pf, the total width of the church of 120 Pf (twice the height of the curtains inside the Castle) and the length of 240 Pf. The vaulted ceilings are of the same type as those of the Castle. The scheme "ad quadratum" does not help to absorb the thrust of the nave, which rises significantly compared to the side. Only the transverse walls, in the attic, receive the thrusts of arches placed between a bay and the other. A precise survey of the building has revealed that, in the period between the beginning and conclusion of the work, there was a change of units in use on the site. The buttresses of the facade have in fact a small but clear shift to the axes of the inner pillars. The 20 Paris feet of each module are transformed, and they measure exactly 11 Milan fathoms (6.544 m). This change suggests that the façade is totally a work of Amadeo, dating to the early decades of the 15th century, after the fall of the Sforza duchy by the French. The Carthusian plan comes from the same schema and from the very same measures of Carmel. The first difference, which affects a significant effect on the internal space, is the reduction in the number of side spans with the elimination of intermediate pillars (so you get a rectangular field of size 1x2, for each square of the nave, in place of the two square spans of Carmel). The material is mixed: the lower parts of walls and pillars of blocked stone, where they overlap and sometimes the upper parts of brick. The construction technique is often the Gothic: you have here very Gothic vaults, not domes, or "voûtes domicales." It would be particularly interesting to see if this pattern matches the original design or the original design had provided for other pillars, where the pillars have been eliminated (only excavation below the original floor, in such positions, could offer an answer to this question). The really new element of the geometrical grid, however, consists of a third "diagonal" square in addition to the double basic square of the plan, as a symbol of transcendence (with the materialization of the root of 2). With this overlap, you get the grid of the eight-pointed star or octogram (in German acht-uhr or acht-ort, eight hours or eight places), we find everywhere portrayed as a symbol of the Virgin of Mercy and her Carthusia, together with acronym Gra Car (Gratiarum Carthusia), even in the floor tiles. In the church of the Carthusia, the centre is the focus of the octagonal dome of Romanesque memory. Even more to the west is the square representing the Holy Spirit. Here, traditionally, there was the baptismal font. Luca Beltrami, who restored the Carthusia in 19th century, spotted the construction scheme based on the "ad triangulum" scheme, albeit with a few, important changes aimed at adapting the vertical thrust of the Gothic style to a more Italian taste. These adaptations are attributed by some scholars to the intervention of Milan Solari brothers. Changes to the design of the Carthusia, as the debate on the constructive schemes of the Milan Cathedral, marked a period of theoretical and practical comparisons among architects "ultramontani," proponents of esprit de géométrie linked to the International Gothic style, and professional Lombard, more likely to adopt "Roman" proportions, less slender, and not to put too much in evidence the structural ribs. The analysis of these issues takes us far. For those who wish to deepen their knowledge, then you should read the studies cited in the bibliographic notes. Since ancient times, the sacred buildings were oriented to the rising sun and frequently they had two pylons or towers marking their façade. Their duality symbolized earthly home of God, in relation to the apparent path of the Sun. Generally, to the modular plant a form was associated which created an upward movement in the third dimension (pyramids, gables spire, towers, vertical development of Gothic churches, etc...). In the Sanctuaries in the Mediterranean area, the square symbolizes the One God and the double square - or rectangle with sides in a 1:2 ratio - represented the Temple, God's earthly abode (the conjunction of Heaven = 1 and Earth = 2). These plans were measured with exact multiples of units in use. Many plans of Christian churches are also based on double square plan. The octagon is an important symbolic figure, because it indicates the transition from the square to the circle, that is, from earth to heaven, thus symbolizing the resurrection and rebirth: it is the soles of baptisteries, many churches consecrated to the Holy Sepulchre of Christ and Roman domes, and is repeated almost obsessively in the mysterious Castel del Monte in Puglia, near Andria. Eight points have the starry Templar crosses and those of Malta. According to a legend the Archangel Michael himself ordered this grid to the first Grand Master, Hugues de Payns: "Your sign is the cross, placed in the octagon." Relationships between prime numbers (1, 2, 3, 5, 7, 11, 13, 17, etc..) have a symbolic value. For example, 11/7 is the ratio of arithmetic Egyptian track, very close to the irrational number pi/2. The golden number indicates the mean proportional of a series endlessly repeatable and corresponds to the irrational number (the root of 5 +1): 2. The Greeks named fi the golden number, the twenty-first letter of their alphabet. It appears in Plato's Timaeus as the physic key of the cosmos. In medieval Europe it was revived by Leonardo Bigollo Fibonacci da Pisa. Born in 1179, he was in contact with Arabic culture in Algiers, he introduced the Arabic numerals in European mathematics and the concept of number. In the 13th century, the philosopher Campanus of Novara translated from an Arabic text the division average (golden number) and presented a personal theory of the pentagon star, which was published only in 1482 in Venice. Following his footsteps, Luca Pacioli of Borgo published in 1509, in Venice, his book De Divina Proportione. The measurement units used by builders in the Middle Ages allowed to get very close relationships with ease, practically, to the golden number. For example, the division of the main duodecimal unit allowed reports 20 inches / 1 foot in Paris, or 20 oz / 1 fathom in Milan, approximately equivalent to the ratio 1:1,66. In architecture the Christian symbol of the golden number rose to Son of God (divine proportion) and figurative expression of the first verses of the Gospel of St. John: "In the beginning was the Word (Verbum) , and the Word was with (in) God and the Word was God. " J. GIMPEL, Les bâtisseurs de Cathédrales, Paris, Ed. du Seuil, 1958. N. PENNICK, Sacred Geometry: Symbolism and Purpose in Religious Structures, Wellingborough, Turnstone Press, 1980.